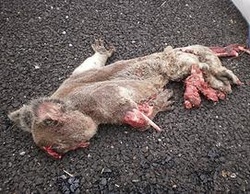 Koalas attacked by dogs may show signs of blood, fur loss or punctures. 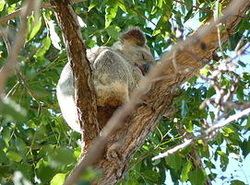 Some koalas may display no signs, but their internal organs may be damaged by puncture wounds. Please restrain or confine dogs at night, and do not allow dogs to roam unsupervised, especially at night. 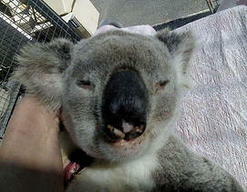 If you see a koala hit by a car, contact us immediately as the koala will need urgent medical attention. 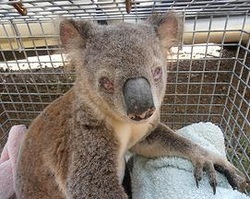 If the koala is in danger of being hit again, cover it with a towel and move it to safely. It is extremely important to stay with the koala until a rescuer arrives to prevent any further injuries. ​Conjunctivitis affects one or both eyes. Signs include weeping of the eyes, pus covered eyes, and pink swollen eyes. ​Cystitis causes a wet, brown, and smelly bottom. This is also known as "wet tail" or "dirty bum".